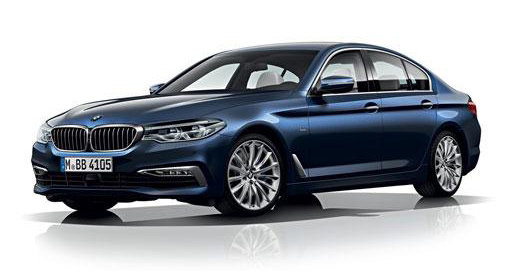 Refined luxury and exceptional driving dynamics are all wrapped up in BMW’s 5 Series saloon package. This top-class executive vehicle is sure to please drivers looking for a prestige vehicle that delivers even-handed power and prompt responses from each option of high quality engines. The 5 Series saloon offers either 17” or 18” light alloy wheels which can be encased in run flat tyres that have their safety features enhanced by Tyre Pressure technology for each of the models in the range. Drive Performance Control technology gives additional directional stability when accelerating and provides additional support for drivers in difficult conditions. The Active Air Stream Kidney grille is framed by sleek looking LED headlamps and LED technology is also incorporated into brake lights at the rear. Dual chrome tailpipes complete the rear look nicely. Safety technologies include rain sensor activated headlight, automatic dimming of the rear-vision mirror and Park Distance Control for both front and rear which emit both visual and audio warnings to aid parking. Cruise control incorporates braking functions too.